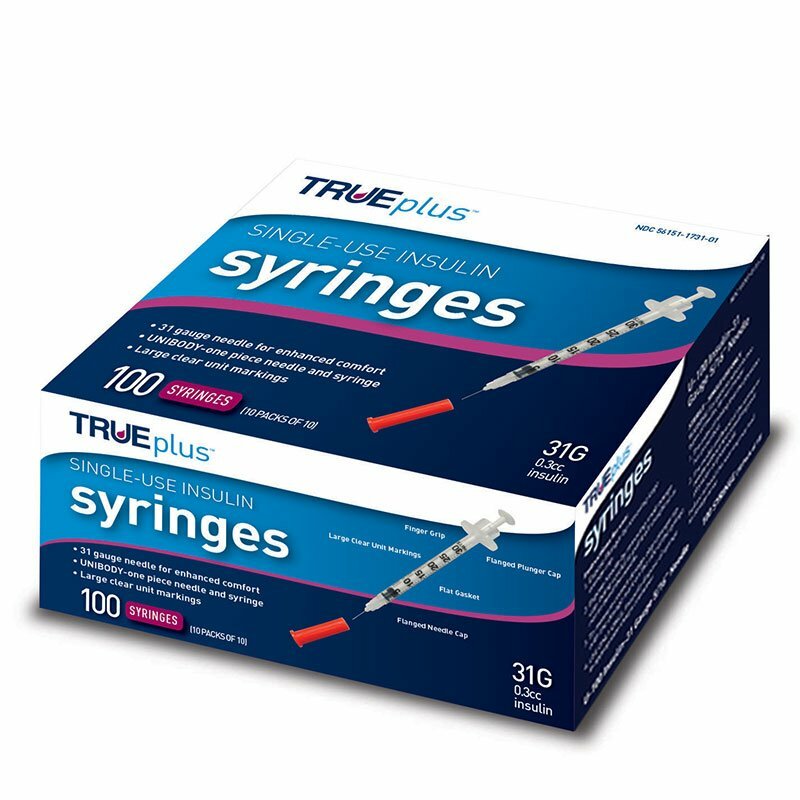 The TRUEplus™ single-use syringes (31G, 0.3cc, 8mm, 100ct) are easy and comfortable to use. They are available in a wide variety of gauges for enhanced comfort. This was my 2nd time ordering from you. I am new to injecting insulin, this product was just what I have been searching for, Small, easy to use, clean packaging, fairly priced, and great customer service. What else could I ask for, Thank You. I buy these for my mom and she said the needles are how she like them, very thin. So if she is happy I'm happy!! The other thing that I like the most is that they ship to Puerto Rico. It was just by chance I found ADW. I've used other brand syringes. I cannot believe what a quality syringe this is! Exceeded my expectations! I saw one review that the person gets a lot of bubbles pulling up the insulin. I'm a retired RN and was taught to pull up the insulin(or any medication) slowly and it will avoid the bubble issue. I've sometimes hurriedly pulled up my insulin and almost always had bubbles to contend with. You can't go wrong with these syringes. Quality and precision and a great financial purchase! I'm spreading the word! Excellant unibody syringe with large numbers for accurate dosing. Small needle for comfort. The price is right, but you get what you pay for. It made a lot of bubbles and I couldn't get them out, therefore the dosages were inaccurate. I liked the other ones (starts with an "M") better. much better. Needles were very good. Just the right size both in diameter and length. Which 31g hard to find. Good suction as well. Price great as well. Wish shipping cost were less! The TRUEplus U-100 Insulin Syringes are smooth and easy to use. The 5/16" needle makes it easier to gauge the depth of insertion. Overall I LOVE the ADW website. I have a diabetic cat and use the Alpha system to test her blood sugar daily so I can accurately regulate her system. The quality of the TRUEplus syringe is wonderful and the price is so affordable. I've gotten one defective syringe in the several years I've purchased the product. Thank you for providing affordable and quality diabetic products for pet owners without insurance!!! !